A while ago I picked up some marshmallow creme from the grocery store, thinking for whatever reason that I had a recipe I wanted to use with it. Once home and searching through my bookmarks I realized I was wrong. And now had a tub of weird globby marshmallow glue to find a way to use up. Eating it on a spoon dipped in chocolate sauce placated me for a few weeks, but I was left wanting. Plus apparently this stuff expires (how?! It's not even real food! ), so I needed to use it up soon. Today I took a sick day from work after hacking uncontrollably and generally being a disgusting mess/spreading my germs around the office for a few hours. Since I'm allergic to sleep, baking is what makes me feel better and helps me relax. I decided to make these vegan chocolate cupcakes, with a marshmallow creme filling, and chocolate glaze. My friend Asia requested I have more lactose-intolerant/dairy-allergy friendly recipes, so this one is for her! The glaze is easily adapted to be made with margarine or shortening. The cake is an old family recipe, and so easy to make. There are a lot of similar recipes around, but trust-- this one is best. 3. Pour water over mixture and mix thoroughly with a fork. Bake for 30 minutes for a cake, and 15-20 minutes for cupcakes. Marshmallow creme, or something less disgusting like buttercream. 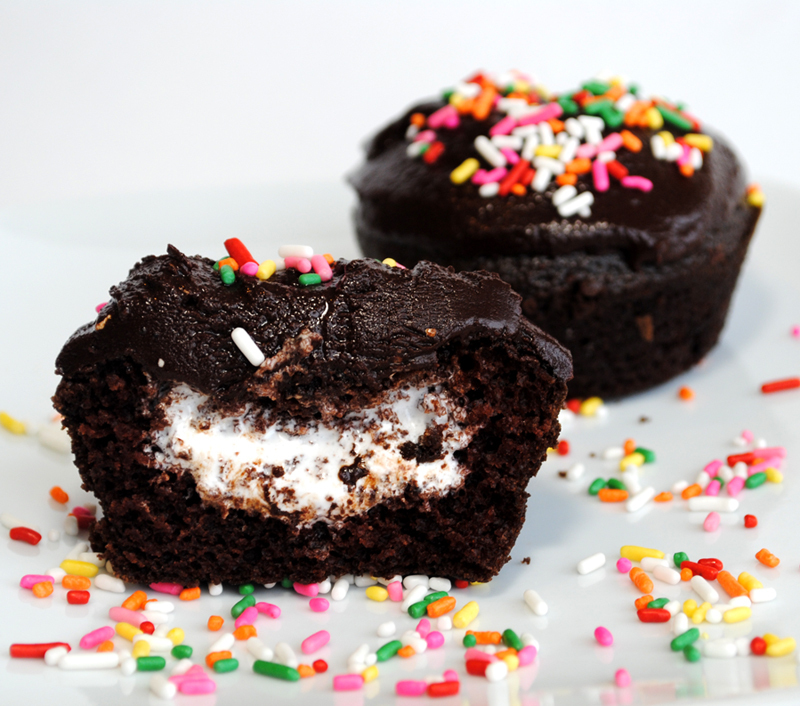 Once cupcakes are cool, cut a small hole in the top and carve out a spot for the creme to sit. Fill the hole with the creme, and place the top snugly back on the cupcake. In a medium saucepan, heat the butter and chocolate chips until smooth. Add in honey and stir until well combined. Dip the cupcakes in the glaze while it is still warm. Top with sprinkles, coconut, whatever gets your mouth off.